While they have their own special needs, dogs and cats are not unlike people. They like to look good and feel good. Every dog and cat, regardless of breed, age, size or type of coat needs to be groomed on a regular basis. Regular grooming can help prevent problems such as excessive shedding, skin and paw disorders, painful mats, even bad breath, and keep you alerted to other problems that might go unnoticed without the extra attention our groomers provide. 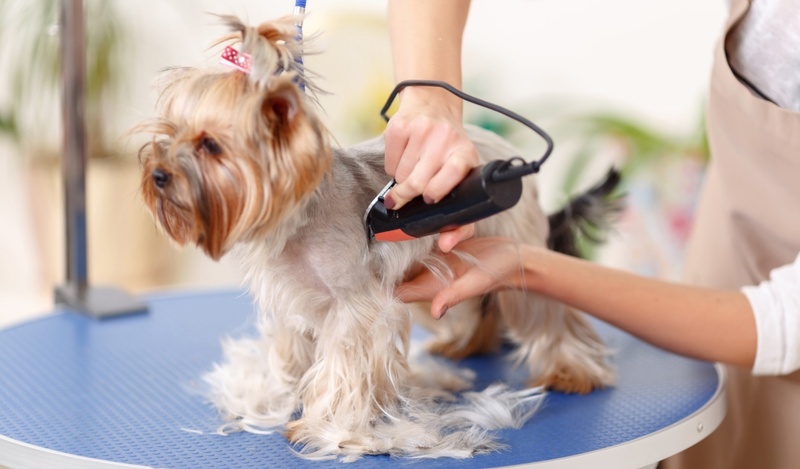 Our skilled groomers are committed to providing a safe and stress free experience for your pet. We never use tranquilizers and our groomers treat every animal with love, patience and respect. Our experienced professionals are trained to style cats and dogs of any breed or size. We offer a wide range of services, including baths, trims and shavedowns for cats, so your pet will always look and feel its very best! As part of our careful care, we also trim his/her nails. A trip to Animal Boutique for your pet is somewhat like a trip to the day spa for you. From the time we greet them at our front door until you pick them up they're pampered and loved. Our pricing varies according to the size of your pet, its temperament and its physical condition. Reservations are not required and we accept walk-ins Monday through Saturday from 7:30 a.m. until 3 p.m.
We take pride in what we do and nothing makes us happier than to send your pet home looking good, smelling good and feeling good.